Could This Jurassic Mamenchisaurid Have Helped Establish Dragon Legends? A team of researchers from Japan, China and the University of Alberta (Canada), have announced the discovery of a new species of mamenchisaurid dinosaur. A paper on the sixteen metre long, Middle Jurassic giant is being published in the Journal of Vertebrate Paleontology. Mamenchisaurids are only known from Asia (majority of fossil finds from central China) and as far as we at Everything Dinosaur are aware, their fossilised remains have been restricted to Lower, Middle and early Late Jurassic aged strata. These animals, members of the Sauropoda, may represent a radiation of Asian, long-necked dinosaurs when the continent was isolated. 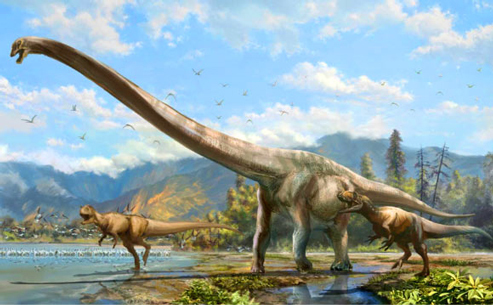 How this group, renowned for their extremely long necks and large front legs are related to other components of the Sauropoda remains unclear. The fossils of this new dinosaur species were uncovered in 2006, when locals were digging a fish pond near Qijiang City, about twenty miles south of the city of Chongqing in central China, although some vertebrae later ascribed to this species were found in the same area in the late 1990’s. The dinosaur has been named Qijianglong, the name is pronounced (chee-gee-ang-long) and the name means “dragon of Qijiang”. The formal, binomial name of this dinosaur that roamed the large, flat floodplains of this part of China some 160 million years ago is Qijianglong guokr. The trivial or specific name honours the Chinese scientific social network “guokr”, which means nutshell. Half the body length of this dinosaur was made up of its neck. The picture above shows an adult Qijianglong being harassed by a pair of allosaurid dinosaurs. A flock of Pterosaurs disturbed by the presence of the dinosaurs takes to the air in the background. Most palaeontologists believe that the long forelimbs and extraordinarily long neck of most mamenchisaurids evolved as adaptations to help these dinosaurs specialise in feeding on the tops of trees, parts of the available plant biomass that other dinosaurs could not reach. The neck of Qijianglong was over eight metres in length, it made up half its total body length. In comparison, most other Sauropods have necks that represent around one third of their body length. Significantly, much of the skull of this dinosaur was found in association with the cervical vertebrae. Analysis of those cervical vertebrae (neck bones) showed that unique among known mamenchisaurids, the neck bones of Qijianglong had a great many air sacs in them. This would have made the neck relatively light despite its great size. Interlocking finger-like processes in the neck bones suggest that this dinosaur had a very stiff neck that was much more mobile bending vertically than horizontally. The neck anatomy has been described as being similar to the steel construction and supports seen in a tower crane. 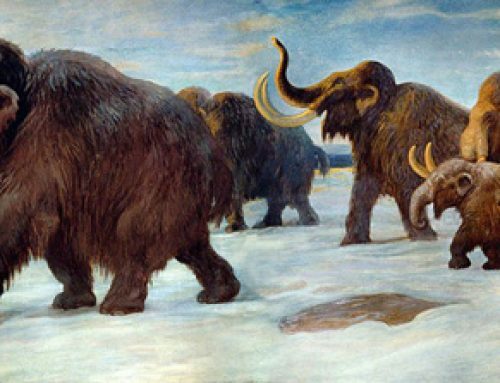 The restored Qijianglong specimen is on display in a local museum in Qijiang City, the palaeontologists involved in this study have speculated on whether the fossilised bones of these huge animals helped inspire Chinese dragon myths. Ironically, since most Chinese dragons are depicted as long-necked reptiles, then early interpretations of dinosaur fossil material that may have inspired stories of dragons, were not too far off the mark.